Dulce grew up in Hamilton, Alabama, with parents and two sisters who are all huge animal-lovers. She always had a four-legged companion by her side over the years, and giving something back by working in the veterinary field is a dream come true. 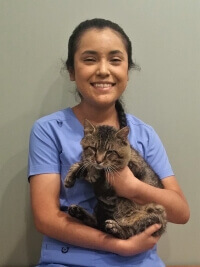 Dulce gets to care for pets hands-on as a Veterinary Assistant with the Bell Veterinary Hospital team! Dulce joined the hospital family in early July of 2018. She finds that she especially likes helping Dr. Bell with routine surgeries, like spay and neuter procedures and learning about the different techniques used—she’s also fond of taking X-rays. Most of all, Dulce loves meeting the area’s pets and animal owners every day—knowing that she’s able to make a lasting difference in their lives is the ultimate reward for her. When she has time between her shifts here at the clinic and her collegiate studies, Dulce enjoys spending time with family and friends, watching her favorite Disney movies and pampering her own pets at home. She and her family have 11 cats and a pair of dogs!